when those things were turned on." The Sulfur Lamp, a microwave-powered electrodeless lighting system, benefited from two high profile demonstrations that helped the technology gain exposure and credibility. 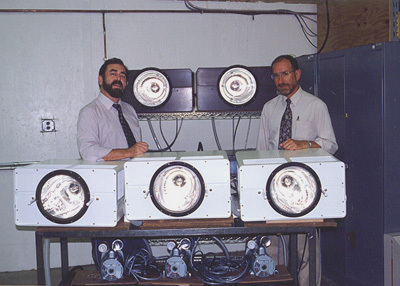 Michael Ury (at right in this photo) and his associates at Fusion Systems invented this radically new lamp in 1990, but faced a market reluctant to chance the technology. Given the system's potential for saving energy, Lee Anderson (at left) decided to lend Ury his support. As lighting program manager in the U.S. Department of Energy's Office of Building Technology, State and Community Programs, Anderson was responsible for evaluating new lighting technologies. He arranged for two sulfur lamps to be installed outside DOE's headquarters building, and three more to be installed inside the National Air & Space Museum's Space Gallery. In the photo, Anderson (who died in 1998) and Ury are showing off those five lamps prior to installation in October 1994. 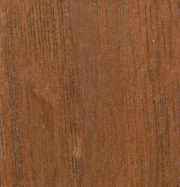 In the quote above, Ury referred to the timing during the ceremonial activation of the demonstration lamps. While he was confident his lamps would work, if a missed stage-cue left the band playing in the dark, it would have been rather embarrassing. The lamps started on cue however, and the demonstration succeeded in introducing the technology to a large audience, as well as building valuable field experience with the lamps. The three NASM demonstrators remained in service until September 1996, the two DOE units a year longer. All five were replaced with production models. Demonstration unit #1 consisting of the projector, power supply, and air compressor was transferred from NASM to the Electricity & Modern Physics Collections of the National Museum of American History after removal. The other four demonstrators were returned to their original configuration (as industrial ultraviolet curing systems).